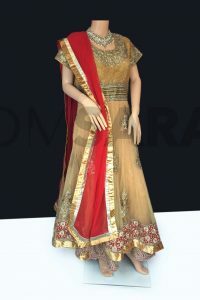 Party Wear Anarkali Suit is beautifully weaved together with enhancing embroidered patterns and swarovski work on the kameez and motifs all over the suit. Comes with matching bottom and dupatta. This can be customised to fit sizes 32,34,36,38,40,42,44 top length 52″ (Slight variation in colour, fabric & embroidery work is possible. Model images are only representative.) Model accessories and latkans are not included.